Dr. Ronald Rivlin graduated with a BA in mathematics and physics and ScD from St. John's College at the University of Cambridge. He studied many topics throughout his life from elasticity and stability to non-Newtonian fluids and electromagnetism. His research helped found a new branch of theoretical physics called "nonlinear continuum mechanics." May 6, 1915Birth, London (England). 1937Obtained BA in Mathematics and Physics, St. John's College, University of Cambridge, Cambridge (England). 1937 – 1942Research Scientist, General Electric (GE) Company, Coventry (England). 1942 – 1944Scientific Officer, Telecommunications Research Establishment. 1944 – 1953Physicist (1944-1947); Senior Physicist (1947-1950); and Superintendent of Research (1950-1953), British Rubber Producers Research Association, Welwyn Garden City (England). 1952Obtained ScD, St John's College, University of Cambridge, Cambridge (England). 1952Immigrated to the United States. 1953 – 1967Professor of Applied Mathematics (1953-1963); Chairman, Division of Applied Mathematics (1958-1963); and Professor of Applied Mathematics and Engineering Science, L. Herbert Ballou University Professor (1963-1967), Brown University, Providence (R.I.). 1958Fellow, American Academy of Arts and Sciences. 1958Awarded the Bingham Medal, Society of Rheology. 1961 – 1962Guggenheim Fellow, University of Rome. 1963Co-hosted Fourth Annual International Congress on Rheology, Rhode Island. 1966 – 1967Professeur Associé, University of Paris. 1967 – 1990Professor of Mathematics and Mechanics, Centennial University Professor and Director, Center for the Application of Mathematics (1967-1980); Adjunct Professor (1980-1990); and University professor Emeritus (1980-1990), Lehigh University, Bethleham (Pa.). 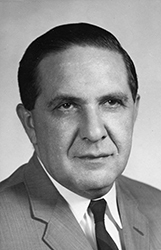 1971 – 1975Vice President (1971-1973) and President (1973-1975), Society of Rheology. 1975Awarded the Panetti Prize and Medal, Academy of Science of Turin. 1977Russell Severance Springer Visiting Professor, University of California, Berkeley. 1980Doctor of Science hon. caus., National University of Ireland. 1980Doctor of Science hon. caus., University of Nottingham, England. 1981Honorary Member, Mexican Society of Rheology. 1981 – 1982Awarded the von Humboldt Senior Award, Alexander von Humboldt Foundation. 1982Doctor of Science hon. caus., Tulane University Foreign member, Accademia Nazionale dei Lincei. 1984Doctor of Science hon. caus., University of Thessaloniki, Greece. 1984 – 1985Fellow, Institute for Advanced Study, Berlin (Wissenschaftskolleg zu Berlin). 1985Member, National Academy of Engineering. 1985 – 1986Distinguished Visiting Professor, University of Delaware. 1987Awarded the Timoshenko Medal, American Society of Mechanical Engineers. 1988Honorary Member, Royal Irish Academy. 1992Awarded the Charles Goodyear Medal, Rubber Division, American Chemical Society. 1993Awarded the Theodore von Karman Medal, American Society of Civil Engineers. October 4, 2005Death, Palo Alto (Calif.). Theoretical physicist and applied mathematician. Co-hosted the Fourth International Congress on Rheology. Advised by Rivlin at the British Rubber Producer's Research Association. Both employed at General Electric Company. Both employed at the British Rubber Producers Research Association. Physicist; Senior Physicist; and Superintendent of Research. Professor of Applied Mathematics; Chairman, Division of Applied Mathematics; and Professor of Applied Mathematics and Engineering Science, L. Herbert Ballou University Professor. Professor of Mathematics and Mechanics; Centennial University Professor; Director, Center for the Application of Mathematics; Adjunct Professor; and University Professor Emeritus. Russell Severance Springer Visiting Professor. Recipient of the 1981-1982 von Humboldt Senior award. Recipient of the 1992 Charles Goodyear Medal, Rubber Division. Recipient of the 1993 Theodore von Karman Medal. Recipient of the 1987 Timoshenko Medal. Received Doctor of Science hon. caus. Vice President and President. Awarded the 1958 Bingham Medal. Received BA in Mathematics and Physics (1937) and ScD (1952). Personal files of Hebrew University professors. Ronald S. Rivlin papers, circa 1940-2005. Collected Papers of R. S. Rivlin/ G. I. Barenblatt, D. D. Joseph, editors. National Academies Memorial Tributes - Ronald Rivlin.